Click the button below to add the ReadyHarvest 3 Month (25 Year Shelf Life) Freeze-Dried Food Supply: 1-2 Person to your wish list. Welcome to our ready-made, just-add-hot or cold water, signature 3-Month package, specially selected to last 25-years on a shelf. No refrigeration or cooking needed - a true worry free food supply. This 3-month package consists of mostly freeze foods and ensures that if there were an emergency and utilities were unavailable, you and your family would make it through easily, without the added stress of wondering what to eat next or how to prepare it. And, this food plan is made of the highest quality freeze-dried meals and quick prepare options. 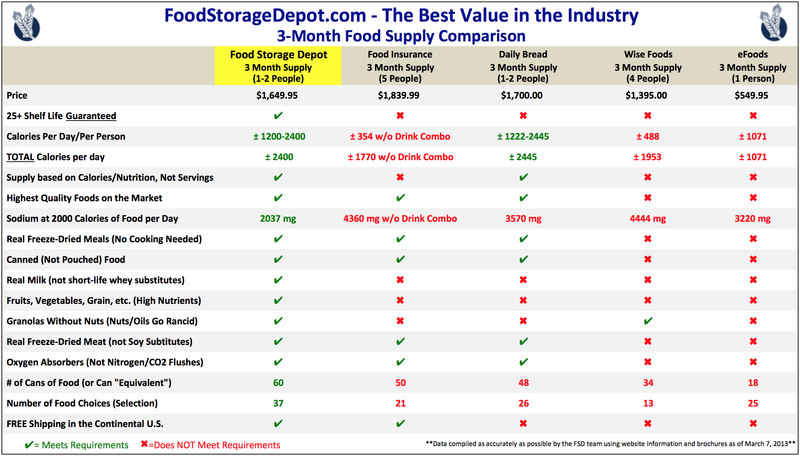 Food Storage Depot makes sure all our food plans contain about 1200-2400 calories per person so you will have enough energy to withstand any crises. You'll notice also a wide variety of food choices to make sure you're getting the right nutrients. We also keep sodium (salt) levels in check so you won't have to concern yourself with hypertension, blocked bowels, and using up your precious emergency water quickly. And, we make sure there are no nutty granolas, whey milks, pancake mixes and other powdery foods that have shorter shelf lives. Food Storage Depot only uses high-end, American-made, double-coated cans with oxygen absorbers in each can to help ensure your food is protected from weather, rodents, and high-levels of oxygen that break down food quickly (often seen with Nitrogen-flushed or CO2-flushed pouched meals). We don't believe you should ever take a chance on food you may eat 25 years from now. At Food Storage Depot, we use both pouches AND cans, so we know the difference. Most of our competitors do one or the other. If you are building up a long-term storage, cans are ALWAYS better, but if you are looking to create a grab-n-go 72-hour kit (also called a "bug-out bag") or something similar, pouches are wonderful because they are easy to access and to open, and they come in smaller portion sizes. Many companies are currently selling pouched food and claiming a 25-year shelf life, but that's mostly because cheaper packaging means more profit, even if they tell a fib here and there. It's the wrong thing to do for your long-term storage!! Even Mountain House, the LEADER in Freeze-Dried food, will only claim a 10-year shelf life on their pouches, and they've been pouching and canning food for 50 years (a lot longer than all the "pouch" companies popping up left and right). Also, pouches are risky because not all pouches seal correctly in mass production, and pouches are not rodent, critter, or tear proof. In the food industry, we talk about the 4 food killers. These are: light, moisture, oxygen, and heat. Food Storage Depot eliminates the first three (the 4th is up to you – to store your food in a cooler location at 70F or less). Yet, there are other factors that most people never talk about when it comes to shelf life. For example, foods that contain oils (such as nutty granolas and whey milk) will go rancid quickly and will not last the 25 years many are claiming. The same goes for powdered foods (such as pancake mixes, cream of wheat, and canned/pouched meals that require cooking to eat). Any time you break down a whole grain into a powdered form, you diminish the shelf life tremendously. Also, the recent fad called Nitrogen or CO2 flushing, doesn’t work. Unless your packages contain oxygen absorber packets inside, the food will spoil quickly. The Freeze-Dried meal leader Mountain House recently tested the pouches from the Dehydrated meal leader Wise Food Storage to find out that the oxygen levels in Wise’s pouches were practically equal to the air we breath, after only 4 months from the packaging date! Nitrogen and CO2 “flushes,” though inexpensive and profitable for the manufacturers, are a risky road to take for the consumer, like yourself. And, by the way, both Mountain House and Food Storage Depot always use oxygen absorber packets with all our foods (including pouches). As a general rule, remember that freeze-dried meals (no cooking needed) will last 25 years on a shelf and dehydrated meals (cooking required) will last about 15 years on a shelf, that is, only if properly stored at 70F or less and if packaged inside cans (with oxygen absorber packets inside). Freeze drying is a process that allows foods to last longer and retain more nutrients than any other method, but because of the complex process (using vacuum chambers and sublimation), it usually costs a premium. Freeze-dried foods can retain up to 90-99% of their nutrients and will last 25 years on a shelf if packaged in oxygen-free cans. Dehydration, on the other hand is done through low-level-heating for long periods of time and may lose up to 40% of their nutrients, yet they preserve very well. Dehydrated foods are more common than people realize (i.e., beans, spaghetti, macaroni, rice, pancake mixes, oats, jerky, etc.). Neither Freeze-Dried or Dehydrated foods require refrigeration when stored, which makes them perfect for emergency food storage. When it comes to meals, Freeze-Dried meals are pre-cooked while Dehydrated meals require cooking. A good portion of our industry claims to sell “Freeze-Dried” meals when they are actually selling Dehydrated meals with a few Freeze-Dried components (like corn, peas, etc.). Don’t be fooled by clever marketing! Both Freeze-Dried and Dehydrated foods are important for a long-term food storage. A 3-month supply should include more pre-made, pre-cooked options (such as Freeze-Dried foods, quick-cook rice or pre-cooked beans, etc. ), in case there are utility outages, and 6-12 months packages should include more dehydrated staples (i.e., rice, beans, oats, etc.) because of the dense concentrations of food in each can, and also because opened cans of Dehydrated food will last 6-24 months on a shelf. In comparison, opened cans of Freeze-Dried foods should be eaten within a few weeks. Most people require between 1200-2400 calories a day to sustain their health, and those calories should come from a variety of foods in order to get the proper nutrients your body needs. (Here is a calculator you can use to see how many calories you and your family require daily: http://www.caloriesperhour.com/index_burn.php .) So, make sure you are getting enough calories and diversity in your foods. As you consider proper nutrients, you need to become aware of sodium levels (salt). For long-term food plans, you should always keep your daily average of sodium under 2400 mg a day. High levels of sodium can cause blocked bowels, hypertension, impaired thinking, and the need to drink more of your precious emergency water in order to neutralize the sodium. And, if you are over 53 years old, it could become lethal. When you consider the investment you're making into emergency food, you want to make sure you are buying healthy, clean food that will last for decades if needed. Some companies will skimp on that quality to increase their profits, which is never good business. That’s why you see substitutions such as pouches rather than cans, nitrogen or CO2 flushes rather than oxygen absorber packets in each container, imported food rather than American, whey milk rather than real 100% non-fat milk (which has much higher nutrients and lasts longer), and high amounts of soups in place of meals. Food Storage Depot goes out of the way to make sure we are providing value to our customers. We work with Mountain House freeze-dried meals (the only real freeze-dried meal company in the U.S.A.). These are the same exact freeze-dried meals sold by companies such as Daily Bread, Food Insurance, and others, because Mountain House is the BEST when it comes to pre-cooked, long-shelf-life meals. Food Storage Depot also prepares and packages our own foods in FDA and USDA approved facilities under our Ready Harvest label. Both these labels are great names in quality. And, all this is done in the good ol' U.S.A.! Conclusion: The bottom line is: if you are going to spend money on food, take the time to understand what you’re buying. The five guidelines above will help you purchase the right way. Why take a chance on food you may be eating 25 or so years from now?